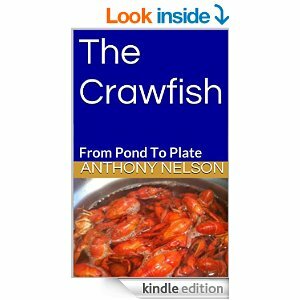 My book “The Crawfish” is on sale on Amazon.com. It is available for sale in the Kindle Format. The latest culinary craze to sweep the country has been centered on a little fresh water crustacean – the crawfish. These aquatic delicacies inhabit lakes, ponds and rivers and are probably in water habitats close to your hometown. Crawfish look like little Maine Lobsters and when cooked properly are as tasty as their ocean cousins. The best thing about crawfish is that they are fun to catch with family and friends and make a delicious feast. “The Crawfish” was written to give you the information you need to catch crawfish. The book covers traps, hand lines, bait, best times to catch crawfish, species and their distribution as well as how to handle and cook your catch. “The Crawfish” is a quick and fun read for the whole family. See why this book has received 5 star ratings on Amazon. If you are interested in crawfish and want a fun adventure on the water, check out this book! NOW ONLY .99 CENTS FOR A LIMITED TIME! This entry was tagged cajun crawfish recipe, crawdad recipes, crawdads, crawfish, CRAWFISH BOOK, crawfish recipes, fishing for crawfish, garlic crawfish, how to catch crawdads, how to catch crawfish, THE CRAWFISH. Bookmark the permalink.